Recalling the narrow remote valleys of Scotland, the Greer Glen Lodge is a blend of Celtic folklore and the highlands of Arizona's White Mountains. At 8,500 feet in elevation and surrounded by national forest the village of Greer is the perfect get-a-way for a cool summer break or winter ski trip. 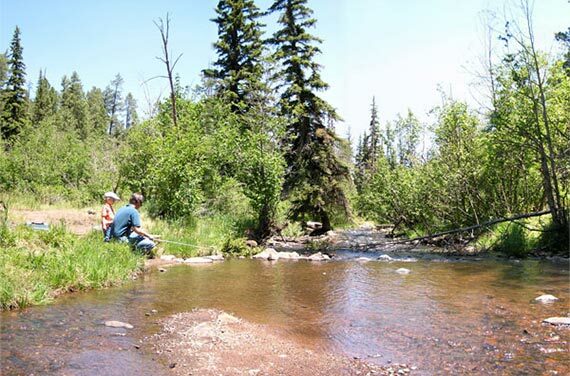 The Greer Glen is situated on the Little Colorado River amongst the aspen and spruce pine. A group of 19 college students, a holiday weekend, and a retreat agenda. What a perfect combination for this amazing property. student responses were: Thank you for letting us stay in your beautiful cabin! We had a wonderful time at Greer Glen Lodge with our whole family. Everybody had gotten together for our 50th anniversary. The lodge worked out well for our large group. If we ever have as large a group again, we will look to stay at your lodge. We had a large group (12 guests) head up to Greer for a weekend of skiing and this cabin had plenty of beds and seating for all of our guests. When we found out we were snowed in for a day, Greer Glen Lodge had everything we needed to make the best of our trip.